VEGAS (February 6, 2019) - February is National Library Lovers' Month, and the Las Vegas-Clark County Library District is celebrating with an exciting announcement - a new partnership with the Vegas Golden Knights organization. 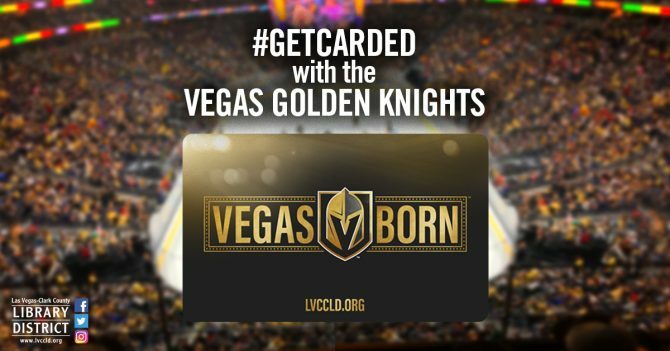 The partnership kicks off with the launch of a special new show of pride that both fans of the library AND our hometown hockey heroes alike will want to own - the new Vegas Golden Knights "Vegas Born" Library Card. Beginning on Wednesday, February 6, Clark County residents can claim their very own Vegas Golden Knights library card at any Las Vegas-Clark County Library District branch. New cardholders can start the sign-up process online at LVCCLD.org, or at their nearest Library District branch, where they must present a photo I.D. and proof of address, such as a utility bill, to obtain the card. Current cardholders who wish to trade in their existing card may do so at their nearest Library District branch.